All information is welcome - please contribute by writing to: info@amos-denison.life on our contact page. Nevertheless, you can watch the next pages - following the Table of Contents (click on the menu button). You can also contact the site host right here. 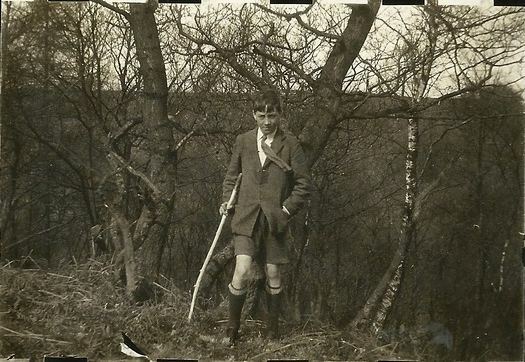 The local newspaper reported AAD as having attended Huddersfield College from January1908 [aged about 10.5 years] to July 1910 and then on to Ackworth School who later in 1977 wrote to confirm that AAD had been there from 1910 to 1914.
probably unaltered from 1908-1910 when AAD was a student. "Thanks to The Huddersfield Daily Examiner"
I arrived here alright as you will have got to know and I also got my box alright. I got into the sixth alright and the priveliges (sic) are fine. On Friday we had the football election and I was made captain and Taylor vice captain. Mr Reynolds says we are not a good lot at English and most of last year’s lot failed English. Please will you send on the Lamb for my football shirt. I got my own bed but a chap opposite snores something awful, it’s like a gattling gun, three of us take it in turns to wake him but it has no effect, and he is one of those chaps who can get to sleep in about two minutes after the lights are switched off and so it is very rarely I get to sleep before 10-30 and to do so I have to hum like his snore and then you see get into it’s swing, though it is neither melodius (sic) or harmonius. (sic) I expect Gordon would have a nice time at Blackpool. Has that N.U.T catalogue come yet and have you sent the “Cyclecar” to me yet? Mr Cooper says he goes through Wallingford, but not Reading, he goes through Abingdon and says it is a decent road. P.S. I am sending my socks home do you mind if I do every week as otherwise they get too small"
on a 1910 school visit to Rievaulx Abbey. And also Gym Lessons as the other photo shows. 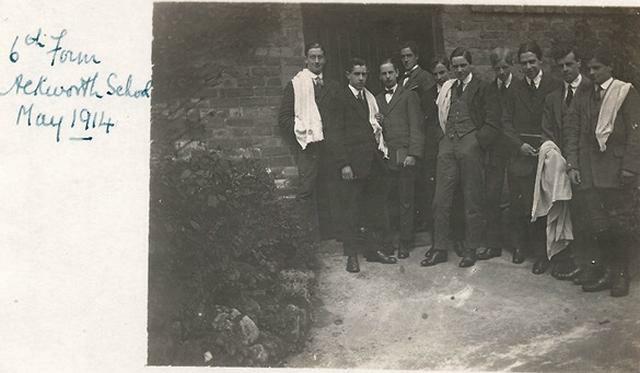 AAD during his last year at Ackworth School - centre, with his hands in his pockets, again! Being "Elected" Captain of the 1st XI Football (soccer) was the start of his prowess and lifetime interest in sport especially Football & Cricket. His youngest grandson went on to be "Keeper of Football"[Captain 1st XI] at Eton. His second youngest grandson went on to score the winning run on the Hampshire County Cricket Ground in the Prep.-Schools Championship and then on to Harrow whose school song was also, evidently, Ackworth's school song whilst AAD was there. Sadly, AAD had died before being able to watch either of his grandsons play. 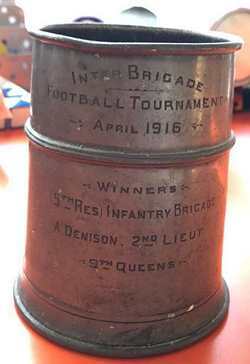 AAD later went on to be in the winning Army Football Team in a WWI Brigade Tournament in April 1916 and then between the World Wars was, evidently, one of the early founders of the Penguin Cricket Club [more research needed for accuracy] in Scarborough. AAD also mentioned having been selected for net trials to play for Yorkshire Gentlemen. AAD then left Ackworth School in 1914 and following the outbreak of the First World War on 28th July 1914 had by March 1915 had joined the Army.  Amos Allan Denison writing to his eldest grandson on 13th December 1972 and on 3rd March 1976. "I was 17 when I left Ackworth School, Yorkshire in 1914 and expected to join the family woollen firm and played about learning designing and weaving in the Mill. However the War was in everybody's mind and I joined up in about March 1915 [saying my age was 19 although aged 17.5 years] in Whitehall, London with two friends. I was hoping to be a motor cyclist despatch rider- having earlier been given a Triumph 3.5HP at home. I was told to walk round the building and come back to say I was aged 21 - which I did. Then to my surprise we were taken to the Mall [in London leading to Buckingham Palace] in a lorry and there told to drive the thing. 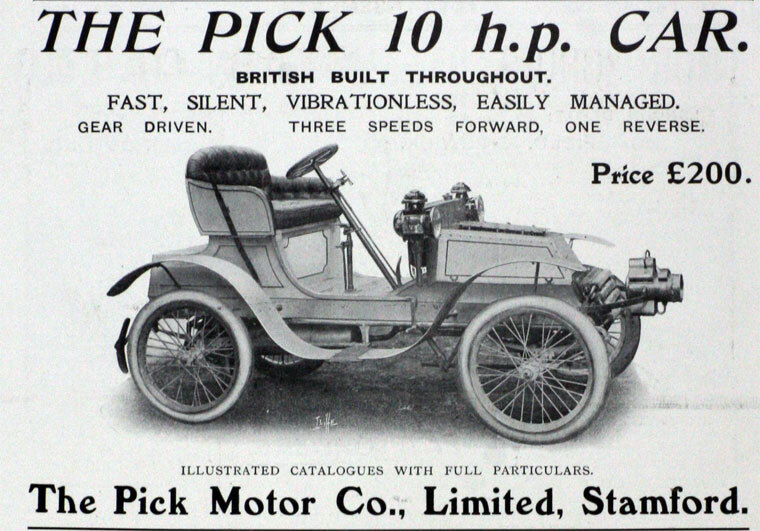 Fortunately I knew how to drive a car as Father had a 20 HP Pick (made in Lincolnshire) I must have passed as we were sent to some barracks near Bromley, Kent. After one month as a Private ASC(MT) I was sent overseas via Southampton, Le Havre and up river to Rouen. Later sent to Boulogne and put in charge of a Thornycroft Lorry with the then Army Service Corps to transport goods to the front and did nothing but unload ships, also in tents on Calais beach. My parents [as committed peace loving Quakers] did not wish me nor my elder brother to be a combatants. However, this was not my idea of the War and I applied for a commission in September 1915 when I would be 18 years old on 5th September and was eventually interviewed at the War Office, London by P. F. Warner [later Sir Pelham "Plum" Warner the old England Cricket Captain] I was commissioned in November 1915 to the Queens Royal West Surrey Regiment (2nd Foot). Warner said I was tall enough for the Guards but without [in those days] a substantial private income Warner believed the Queens to be the next best Regiment of Foot in the British Army. We trained at Shoreham and when the Irish Rebellion started we had been in Fermoy and spent our time rounding up the Sein Fieners. 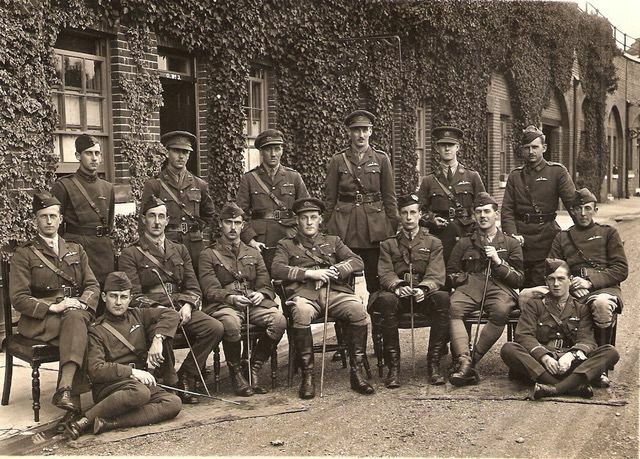 At that time the Royal Flying Corps were an elite Corps. I transferred and learnt to fly at Netheravon & Upavon on the Salisbury Plain in July 1916 and made my first solo flight for 10 minutes on 21st July after one week's instruction. and finally passed out on 16th September 1916 and given my wings in a F.E.8 Single Seater Mono engine Scout now called "Fighters". 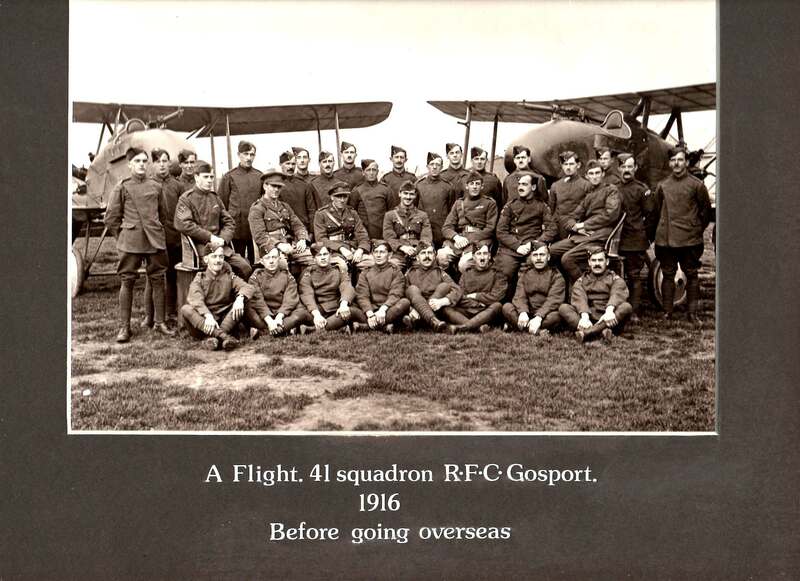 I joined 41 Squadron RFC in Gosport, Hampshire and we few flew across the Channel - quite an experience in those days. Our job was to patrol above the trenches and do what were called offensive patrols over the German held territory. Often we were at about 10,000 ft with no oxygen or parachutes. One day, though, our own artillery were strafing and I saw what looked like a shell nearby at the top of its trajectory - very scaring! Our airfield was at Abele, behind Ypres and patrolled from the Belgian floods in the North down to South of Armentières. I had a few skirmishes with the "Huns (our name for the Germans) but was brought down over Ypres by the Richthofen Circus [Baron Richthofen's sister was married to D.H. Lawrence] on 24th January 1917. I was patrolling with Lieutenant Fraser when we were attacked by four either Albatrosses or Halberstadt. Fraser had engine trouble and I was left alone. In a dog fight you twist and turn and try to keep the enemy off your tail. We had tracer bullets to help firing and one got me. However, I was wounded in the arm and my engine was hit. It was a 100 HP Monosoupape (single valve) where the rotary engine is at the rear of the cockpit and fortunately was able to take a lot of the bullets when I was forced to descend having no power. 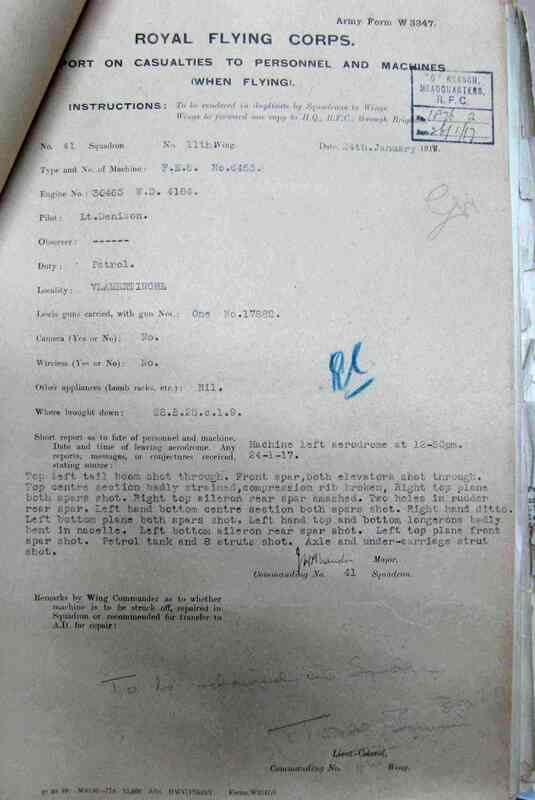 I was later told there were about 90 holes in the aircraft as shown in the Casualty Report. I got one of the enemy machines and was credited with two others. I was awarded the Military Cross. The Distinguished Flying Cross, "DFC", did not come into being until April 1918 when the R.F.C. and Naval Air Service became the R.A.F. The citation in the London Gazette read "Although wounded, he continued single-handed to fight two enemy machines and succeeded bringing one of them down. Later, although his machine was badly damaged, he effected a successful landing. He has at all times displayed marked courage and initiative." Whilst serving with the RFC I was granted a Regular Commission with the York & Lancaster Regiment there being no Regular RFC at that date and we were therefore seconded to the RFC. [AAD used to relate that the Army had no idea how to categorise "pilots and their machines" so machines were first categorised as "horses" such that AAD & fellow officers received "Hay Allowance" in their initial pay packets] I believe that after I left the front that my 41 Squadron and certainly 46 Squadron in which my friend Eric Armitage was killed did a lot of trench strafing, a useless and dangerous occupation. Our aircraft [F.E.8] when we first went out in 1916 were supposed to be the best and superceded the DH2. However as our ceiling was 10,000 to 15,000ft according to the weight of the pilot and the engine fitness the German Albatross, Fokker triplane were better and the supremacy kept changing until 1918 when the SE5 and Sopwith Camels were equal to any. 1917 my year was a bad one and many good chaps were shot down. Remember flying was in its infancy and we didn't know how to get out of a spin until it was safely demonstrated in early 1917 in tests at Farnborough. I was invalided home and after leaving hospital in London, I was posted to Tadcaster and instructed new pilots. Later I was again posted to France as a test pilot, testing newly repaired machines and I also did the test on a Bristol Fighter to judge whether a two bladed propeller was better than a four bladed propeller at various heights and speeds. Later I was put in charge of the Issue Section of 2 Air Squadron Supply Depot. We had a large number of various aircraft and in early 1918 when the Germans made their final push we were heavily bombed but we got most of our aircraft back to an airfield further away from the front. I was awarded the order Member of British Empire(Military) "MBE" for this being a Captain at the time. This being an "Order" it is the first of medals followed by the MC, then the 1914-1918 Campaign Medal, the General Service Medal and the Victory Medal. I was mentioned in despatches by Field Marshall Douglas Haig in 1918 which was announced in the 1919 New Year's Honours and that means an Oak Leaf in on the Victory Medal. This award was for "Testing Aircraft and for Commanding a Replacement Unit". The other medals are for the 1939 -1945 War and are the Campaign Medals again with an oak leaf for a mention in despatches This was awarded for my work in organising the arrival of the American Air Force to RAF Atcham in Shropshire [whose CO was Col. Roy Baum, an architect from Princeton in peacetime, who became Godfather to AAD's youngest son, David]. The last medal is the Air Force Service Medal, similar to the Territorial Medal for the Army and denotes long service with the Royal Air Force Volunteers." All additional information is welcome - please contribute by writing to: info@amos-denison.life on our contact page. 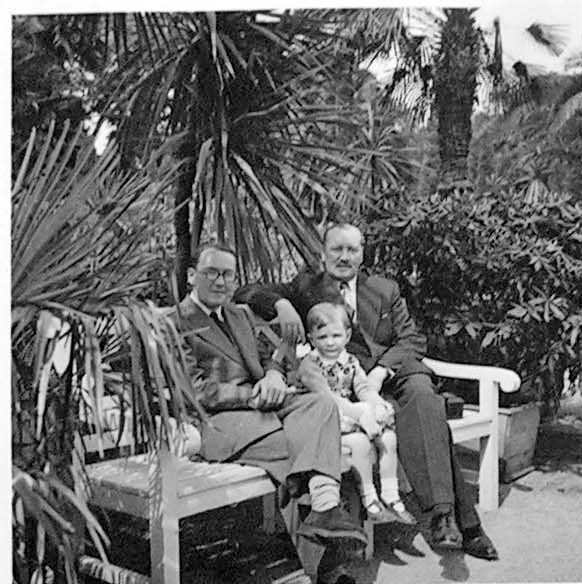 According to his youngest son, neither AAD nor any of his wartime colleagues [1st and 2nd World Wars] ever spoke much about their wartime experiences - it was just "not done" in those days. Only pressure towards the end of his life from his eldest grandson in relation to a school project did AAD [over 40 years ago & then in his late 70's] agree to pen a few words that have been so carefully preserved by his grandson. If, occasionally, AAD did speak about the First World War it was not about his own experiences but about his anger. Anger that so many people suffered as a result of four related royal families and a few handfuls of politicians being unable to resolve issues but quick enough to fuel hatred amongst their populations. Has very much changed in 2018? 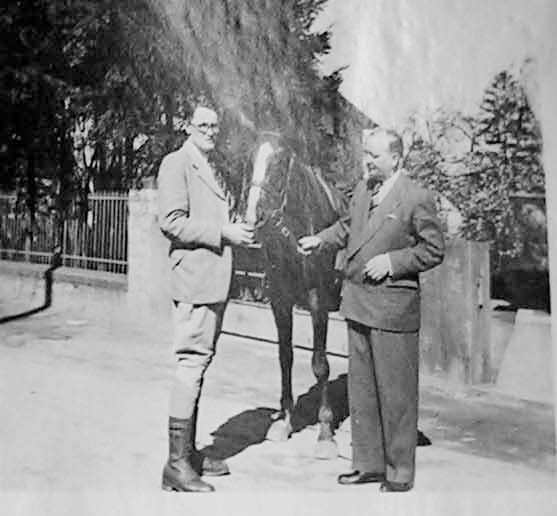 He also referred to what is now a famous comedy line in a popular TV series "We were often told that the Royal Families & Generals were right behind us - yes, about 60 miles at least..."
Despite his heroics, AAD had been brought up in Yorkshire as a peace loving Quaker. So it was not surprising that in his 60's he occasionally remarked that the real victors of the 1914 -1918 War were not individual countries but ordinary folks. They saw the oppressive royal families of Russia, Germany and the Austro-Hungarian Empire swept away [even the British royal family was forced to change its name to plain "Windsor"], in England they saw the introduction of income tax on the rich, very low wages began to rise, [leading to the demise of many controlling landowners] and [when AAD was already in his 20's] the right, at last, for Englishwomen to vote. But at what cost of human life and limb and family sufferings. In 2018, he would undoubtedly be grateful that his generation's sacrifices are still respected 100 years after the cessation of hostilities. He would be saddened, though, that the majority [just!] of ordinary English folks still find difficulty in being in union with our colleagues and often extended family members across the Channel that he had flown over, alone, with no parachute and no radio, in 1916.